The article is an introduction to a discussion on the status of ludology as an academic discipline dealing with games research. 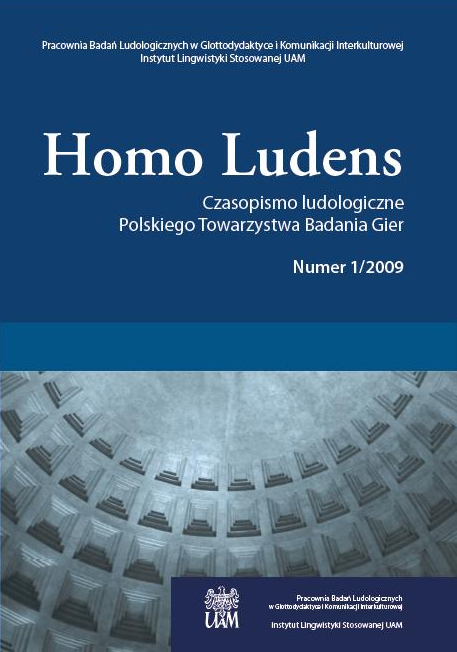 It presents a summary of the most important research in this area and outlines the basic differences between the perception and scope of research of ludology in Poland and abroad. Abt, C. C. (1971). Ernste Spiele. Lernen durch gespielte Wirklichkeit. Köhln. Björk, S., Holopainen, J. (2004). Patterns in Game Design. New York: Cengage Delmar Learning. Caillois, R. (1997). Gry i ludzie. Warszawa: Volumen.